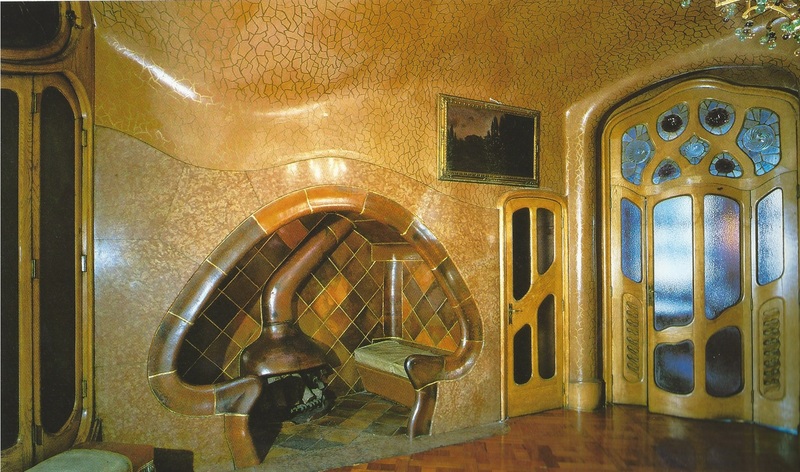 Raised in Ohio in a rectangular house with rooms the same, filled with French and Italian Provincial furniture, Casa Batllo, in Barcelona, was a new awakening for me. 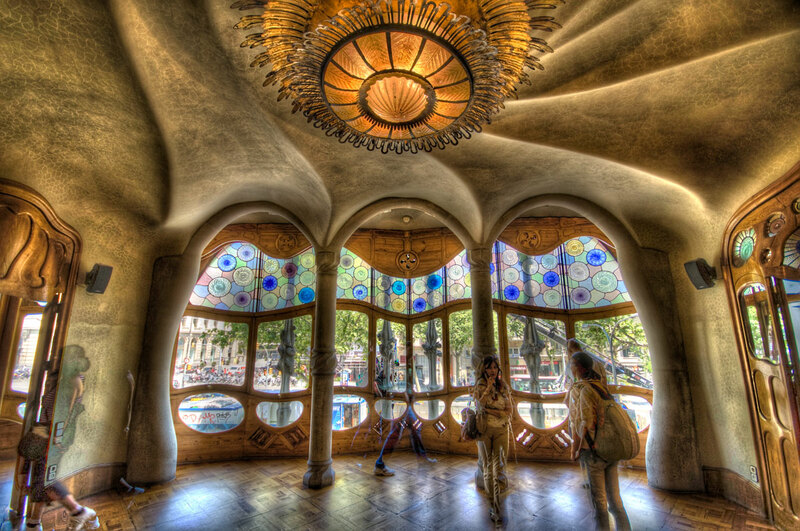 Antoni Gaudi, born in 1852 and died under the wheels of a bus in 1926 on his way to church, was a brilliant proponent of organic design and leader of the Spanish avant-guard. He renovated this building for Joseph Batllo in 1901 and it became the focal point of the block. 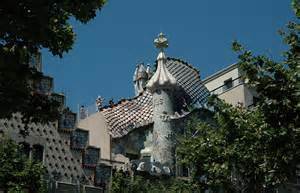 But this was the first time I had seen Casa Batllo with its organic and graceful movement from the ground to the rooftop. Since there are no straight lines or corners in this building (or many others), the curvature leads your eye to the fireplace! What a spot to curl up with a book/wine in such a comfy location. Then to the large front room we saw from the street. Now we are looking out these wild curvaceous windows to the world beyond. Already overwhelmed by the house, I was not prepared for the rooftop. Although you can only see it from the street side, it’s worth it. 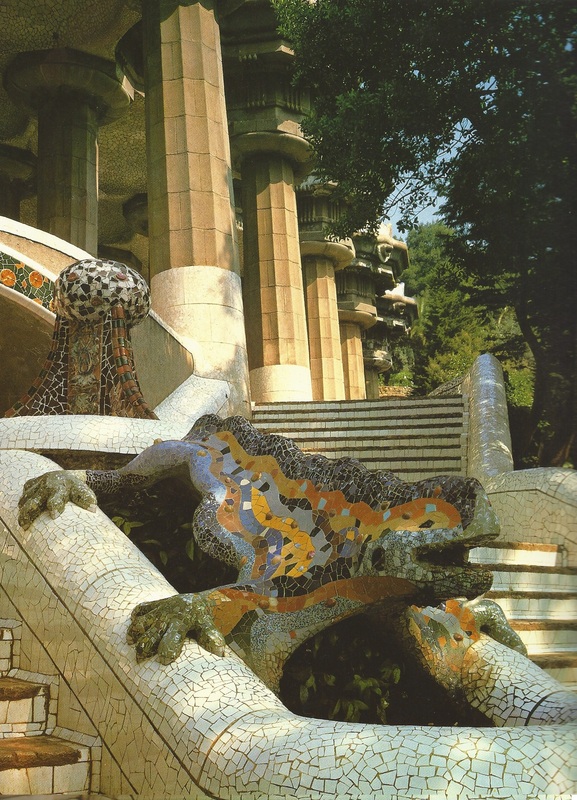 Gaudi “sweeps” his building upwards to be encircled by a serpent’s tail….a combination of curves studded with broken glass, colored clay chips and topped with darker colored balls: a vibrant reptile protecting the building below. 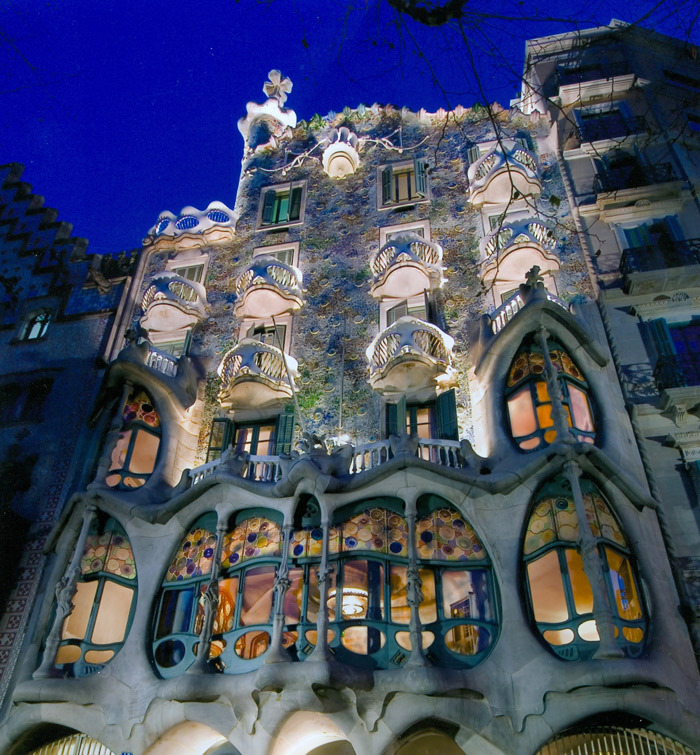 Gaudi was hindered by rheumatic ailments all his life….consequently he channeled all his energy and passion into his “creations”. 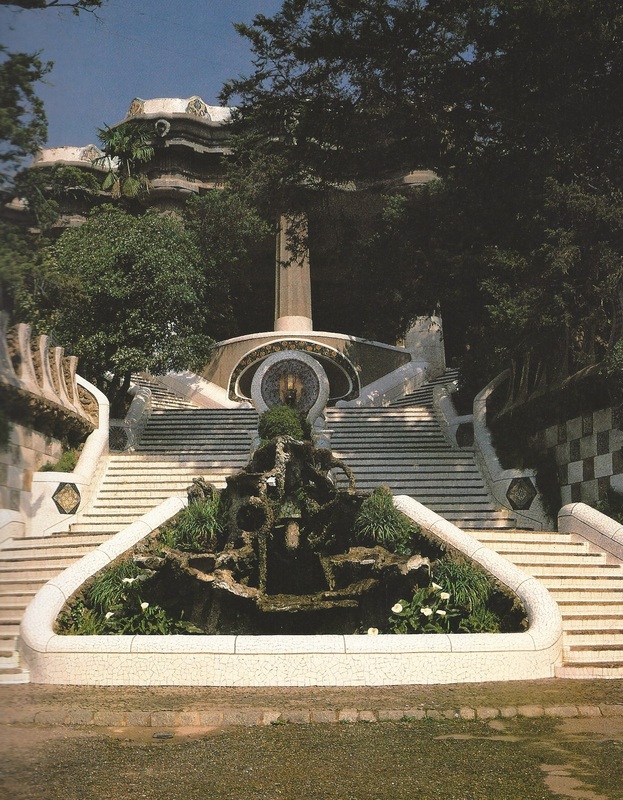 And from a magically remodeled house, we see the “creation” of a magic park: Guell Park (1900 to 1914). Eusebi Guell, owner of the property, originally planned for an “exemplary” suburban colony of homes. 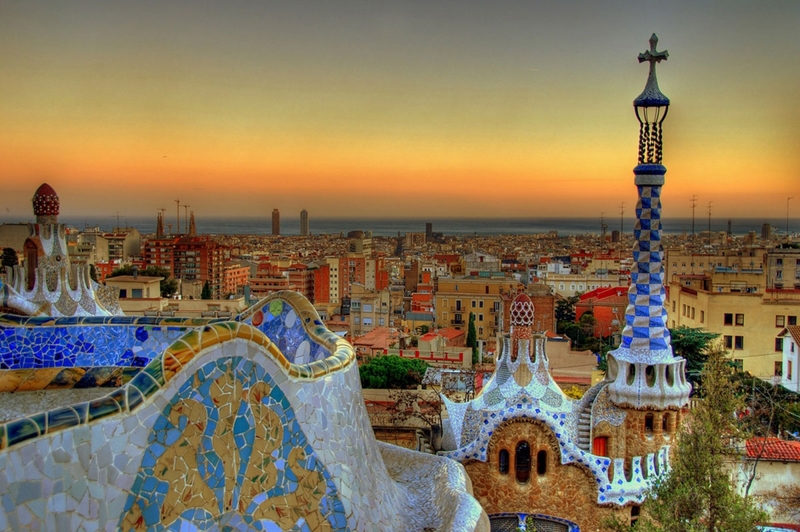 Yet Gaudi built a park……to the benefit of all of Barcelona! The land was barren with stony, dry earth which made it unsuitable for both a settlement or a park. Look at the picture here of the entrance. Parallel stairs circling what seems to be a large “planter” which, in reality, is a deep cistern collecting the rain water so vitally needed for the shrubs and trees. 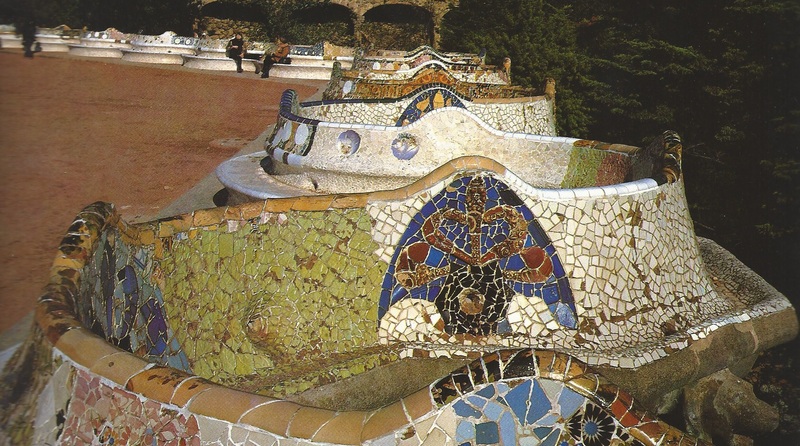 There were some steep hillsides on this 50 acre plot of land where Gaudi incorporated the rain runoff into collection viaducts for filling the cisterns. Coming up the staircase we find the “Dragon/Protector” covering covering another cistern. He represents “Python”, the guardian of subterranean water. This leads us to the columns rising behind him. This columned hall both keeps one dry and supports the roof, which serves as the floor for the Greek theatre above. 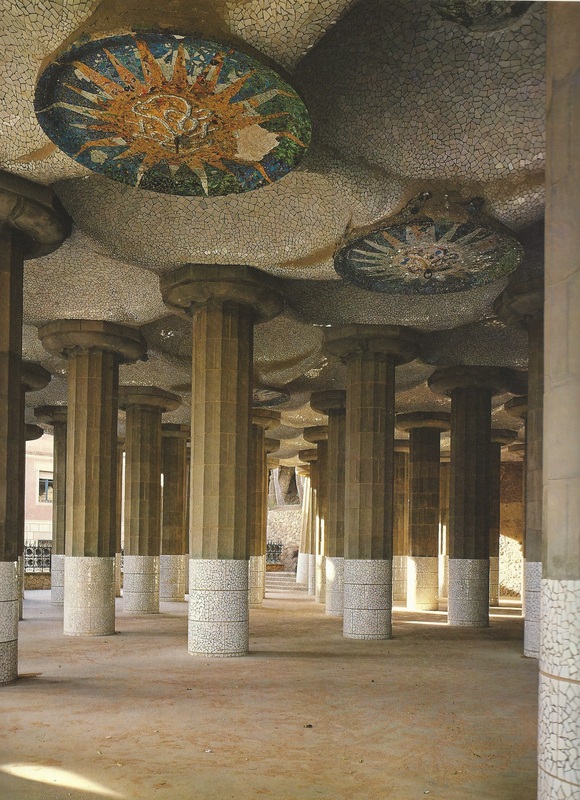 They are Doric columns with colorful and brilliant motifs. Gaudi almost completely built this park using material found in the existing landscape. Building roads and viaducts produced stones and rubble which he incorporated in his construction: preceding the “collage” technique of the Dadaists in the 20’s. 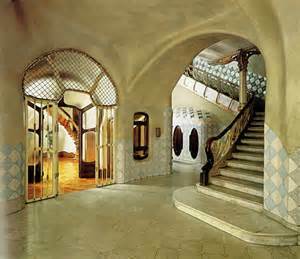 This last picture gives us an idea of how far Barcelona had to grow to catch up with Antoni Gaudi! Our Serendipity has been not tearing down our old house when we got home from this trip….but making softening changes over time. We use to have 8 trees in our garden… now we have 15… that’s a start!